Recording Officers : Insp Nom Phot a/l Prack Dit at Office D6, 3rd Floor, Bukit Aman on 9th November 2006 at 1307 afternoon. On 9th (sic) November 2006 I was asked by the investigating officer K/ASP Tonny Anak Lunggan to record the statement of a Malay inmate named Sirul Azhar Bin Haji Omar Kp RF 125591. The inmate was then brought to me and I ordered the release of his handcuffs. IT IS MY RESPONSIBILTIY TO WARN YOU THAT YOU ARE NOT OBLIGED TO SAY ANYTHING OR TO ANSWER ANY QUESTIONS. BUT WHATEVER YOU SAY WHETHER IN ANSWER TO A QUESTION OR NOT SHALL BE GIVEN AS A STATEMENT. S. Do you understand the warning that has been read and explained to you? S. Do you have any questions about the warning? S. Do you want to give a statement? J. Yes I want to give a statement. S. What do you want to tell me? J. As a member of the Special Action Unit (UTK) on an undetermined date 5 or 6 days before the incident on 19th October 2006 while I was in my office I received a telephone call from Tuan Azilah (Azilah) the officer above me requesting that I meet him in Central Market. I could not meet him at the time because I was together with Tuan Khairy as his driver. At that time, I was driving Tuan Khairy to deliver hampers in Selayang and Batu Caves. On my way to there roughly after 12 noon I received another call from Azilah who asked me where I was and I told Azilah I may be late coming back as I was assisting an officer and I replied I would call him back after completing my duties. At around 3.00pm, after dropping off the officer at the office in Bukit Aman, Azilah telephoned me again and told me to meet him in Central Market. At about 3.15pm I met Azilah at Central Market. He instructed me to observe Hotel Malaya where the woman who was disturbing the businessman [sic] stayed. Azilah also informed me there were three women staying in a room on the 8th floor, the number of which I am unable to recollect. After that I went together with Azilah in my car, a Satria bearing registration number WEA 4717 to look for Hotel Malaya. On the way there, Azilah talked about a reward of between RM50,000 and RM100,000 if the case was settled. Azilah and I however failed to locate the hotel after circling the area many times. After failing to locate the hotel, Azilah and I returned to Central Market and while we were there, Azilah asked an artist at Central Market for directions to Hotel Malaya. The artist, who was Malay, drew a plan of the location of Hotel Malaya . After that Azilah and I walked towards Hotel Malaya. We reached Hotel Malaya at 4.00pm. When we arrived at Hotel Malaya, Azilah invited me to go to the 8th floor of the hotel. After we reached the 8th floor Azilah showed me the room that was occupied by the woman who was disturbing Razak. While on the 8th floor, Azilah asked me to “shoot to kill” all three women in the hotel room and asked that I stay in any one of the rooms on the 8th or 7th floor or any other floor with all lodging expenses borne by Azilah. I informed Azilah that I would not be able to do it because of the presence of CCTV (closed circuit television cameras). After that Azilah and I took the stairs to the 7th floor to find a suitable room to stay. After looking at the room, I found it to be unsuitable and Azilah and I returned to Central Market. Upon arriving at Central Market, Azilah ordered me to use my car and drive to Razak’s residence to observe the residence. At about 4.30pm Azilah and I were driving when Azilah pointed Razak’s residence to me. I then drove my car and reached a petrol station near the Puduraya area. Azilah filled the petrol tank with RM30 worth of petrol. After filling the petrol, Azilah and I drove back to Razak’s residence in Damansara Heights. After observing Razak’s residence, Azilah and I returned to Central Market to enable Azilah to get his car. After dropping Azilah at Central Market I went to the UTK office in Bukit Aman. After that I did not contact Azilah again. On 19th October 2006 at about 8.30pm while I was at home in Kota Damansara, Azilah contacted me via his mobile phone and asked me to go to Razak’s house immediately. Azilah also mentioned there was a Chinese woman who was causing a commotion in front of Razak’s house. I was ready at about 8.40pm and drove my jeep bearing registration number CAC 1883 towards Razak’s house in Damansara Heights. Upon arriving in Damansara Heights, I stopped my jeep a distance away from Razak’s house. After parking my jeep, I walked towards the entrance of Razak’s house. When I arrived in front of Razak’s house I saw Azilah together with a Malay woman in front of the house. There was a car and Azilah was outside the car and the Malay woman was inside the car. I saw a Chinese woman talking to an Indian man whom I did not recognize and also a Chinese taxi driver who was seated inside the taxi and security guards inside Razak’s house. I then entered the car which was a red Proton Wira and sat in the passenger’s seat. While I was seated in the car, I saw Azilah persuading the Chinese woman with the help of the Malay woman to sit in the same red Proton Wira Aeroback where I was seated. The Chinese woman entered the car and sat behind me while the Malay woman also entered the car and sat behind Azilah who was in the driver’s seat. While Azilah, the Chinese woman, the Malay woman and I were seated in the car, the Chinese taxi driver came and asked for the taxi fare from the Chinese woman. Azilah gave him RM50 but the Chinese man demanded an additional RM150 because he said he had to make several trips. Azilah then gave the Chinese man RM100. After that Azilah drove the Wira car towards my jeep. Upon reaching my jeep, I alighted from the car and drove my jeep out of Damansara Heights towards Kuala Lumpur. During the journey, Azilah called and said we would have to transfer the Chinese woman to my jeep and said that we should look for a spot. When I arrived at Jalan Duta I stopped my jeep by the side of the road and got down from the jeep and I asked Azilah whether the spot was suitable to do the transfer. Azilah replied that it was not suitable and suggested Bukit Aman instead. I then went ahead to Bukit Aman followed by Azilah closely behind and arrived at Bukit Aman at about 10.00pm. Upon reaching Bukit Aman, I stopped my car at the back of the Bukit Aman officers’ mess and Azilah, together with the Malay woman, brought the Chinese woman to my jeep. I noticed the woman was refusing to get in while being pushed into the back of my jeep. After the Chinese woman got into my jeep, Azilah entered my jeep and sat in the passenger seat. I drove out of Bukit Aman followed by the red Proton Aeroback which was driven by the Malay woman. I could no longer see the red Proton Aeroback driven by the Malay woman once we had passed the entrance to Bukit Aman. Along the journey, Azilah asked me to find a place to “shoot to kill” the Chinese woman. Before arriving at Jalan Duta I noticed the back left tyre of my jeep was punctured. I drove through the Smart Tag lane at the toll booth and stopped on the left hand side of the road to change the tyre. While I was changing the tyre, I noticed two Road Transport Department (JPJ) officers on duty but I continued to change the tyre with Azilah’s help. After changing the tyre, I drove to my house in Kota Damansara to take the explosives that I had kept there. After taking the explosives I got into the jeep and drove to Sungai Buloh and Kuala Selangor before arriving at the Punchak Alam forest reserve at about 11.00pm. At the Punchak Alam forest reserve as I was bringing the jeep to a stop, I felt a pain in my stomach and got out of the jeep and relieved myself (defecated) not far away from the jeep. 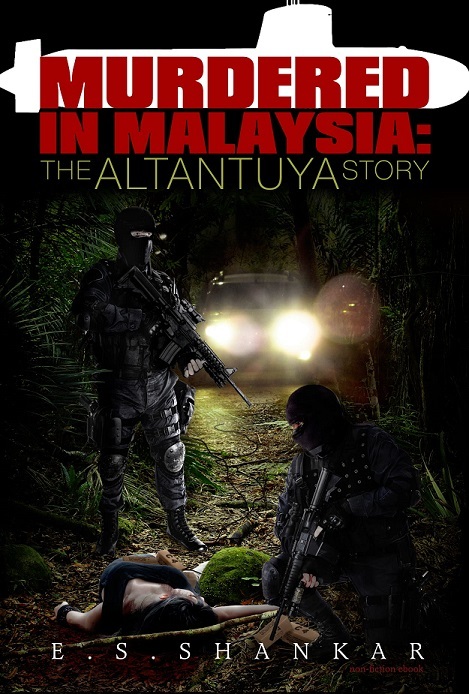 After I had relieved myself, I went back into the jeep and at the same time I saw Azilah outside the jeep carrying a bag containing an M5 weapon and silencer from the jeep that was located at the foot rest of the passenger seat and gave it to me ordering me to “shoot to kill” the Chinese woman who was inside the jeep. After asking for the Chinese woman’s articles, the Chinese woman surrendered her jewellery. She then asked to be allowed to urinate. Azilah brought her down from the jeep and I saw the Chinese woman urinating by the side of the jeep. After urinating, she saw the weapon that I was holding. I saw that she was in a state of fear and she pleaded not to kill her and said she was expecting. At the same time, Azilah wrestled the woman to the ground and I could see that she had fallen and was in an unconscious state. I opened fire towards the left side of the woman’s head. After the Chinese woman was shot, Azilah removed all her clothes and I took a black garbage bag and Azilah put all the Chinese woman’s clothes into the bag. After putting all her clothes into the bag, Azilah noticed movements in the Chinese woman’s arms and ordered me to fire another shot but the gun did not fire. I then emptied the weapon and loaded the gun again and fired another shot at the same area which was the left side of the woman’s head. I then took a black plastic garbage bag and with Azilah’s help put the bag over the Chinese woman’s head to prevent blood from spilling. After that, I lifted the hands of the victim while Azilah lifted the legs of the victim, and we carried the victim into the woods. Azilah then carried the bag containing the explosives and handed it to me. I took the explosives and attached it to the victim’s head while Azilah attached the explosives on the victim’s legs up to the abdomen. Azilah then pulled the long wire towards the jeep and I altered the position of the jeep so that it faced away from the woods and drove the jeep about 15 meters from the victim. After the detonation of the explosives, I pulled the excess wire into the jeep and left the scene and headed towards Bukit Aman. Azilah and I arrived at Bukit Aman at approximately 12 midnight. At the UTK office, Azilah handed me approximately RM430. After that I had a bath and changed clothes and put the clothes that I wore during the incident together with the victim’s clothes into a plastic bag. After that, I entered the jeep and drove the jeep to a rubbish container in the Bukit Aman area near a construction site. I threw some of the victim’s belongings and the wire that was used to detonate the explosives together with the empty bag that contained the explosives into the container. After throwing the things, I drove the jeep out of Bukit Aman and head towards my house in Kota Damansara. I threw the victim’s clothes and my own clothes along the way to my house. I arrived at home at about 1.00am and to lay down to rest and slept. After that I did not have any contact with Azilah until I was sent back from Pakistan and was arrested. S. To whom did the MP5 weapon and silencer belong to? J. The weapon belonged to the UTK Bukit Aman and was for my use. S. What do you mean by the word “jimat”? J. Jimat means “shoot to kill”. S. Are you telling the truth. J. Yes it is the truth. The statement was read back to Sirul Azhar Bin Haji Omar KPT/Paspot RF 125591. S. Do you wish to make any amendments or additions to your statement after the statement has been read to you? S. Are you giving this statement voluntarily? The recording of the statement ended on 9th November 2006 at 1635 hrs.